Photograph collection of webmaster A gloomy day finds a Class 40 and breakdown train coming to the rescue of derailed D5258 at Burscough Bridge (on the Manchester - Southport line), date unknown, but certainly before July 1969. The sixteen year four month career of D5258/25108 included allocations to London Midland, Eastern & Scottish Region depots. Time between last Classified repair and withdrawal: 45 months. Time between withdrawal & scrapping: 5 months. September 1964 to Nottingham (16D). 25108 was the 35th Class 25 withdrawn, one of four retired during July 1980. 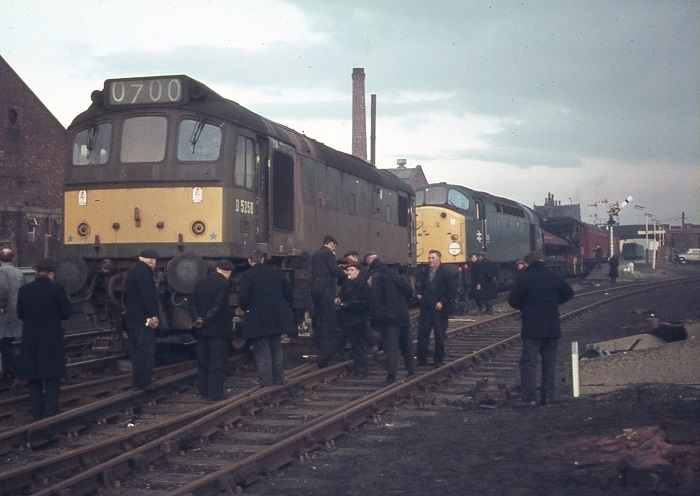 After withdrawal 25108 was stored at Glasgow Works with much of the locomotive broken up there by December 1980. Parts of the cab and boiler room panelling & roof remained in use as a shed (?) until cut up during November 1988. 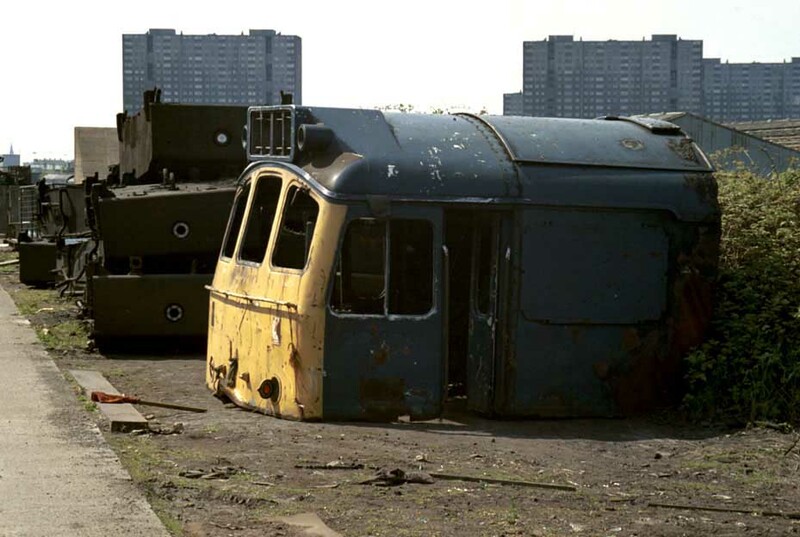 Photograph courtesy Phillip Moore The remains of 25108 at Glasgow Works on May 13th 1984. Noted Glasgow Works September 1976. Observations at Derby on July 3rd during daylight hours revealed amongst other things the 10.28 Newcastle - Bristol was noted an hour late behind D5258. On December 14th the 17.15 Derby - Nottingham was worked by 5258 with hauled stock. On September 9th whilst on electrification work at Barton (Preston) 5258 derailed in the down loop, luckily falling away from the running lines, retrieval was four days later. The roundtrip Nottingham - Llandudno Town on July 5th was worked by 25108, whilst the next day (6th) 25066 & 25108 worked a roundtrip Burton - Yarmouth excursion. After transfer to Eastfield during July 1975 a number of internal passenger services were worked. 25108 was stabled at Perth on July 14th. On July 20th 25108 worked the 13.20 Aberdeen - Glasgow (throughout?) arriving about 20 minutes late. Photograph courtesy Danny Preston, collection Neil Johnson. 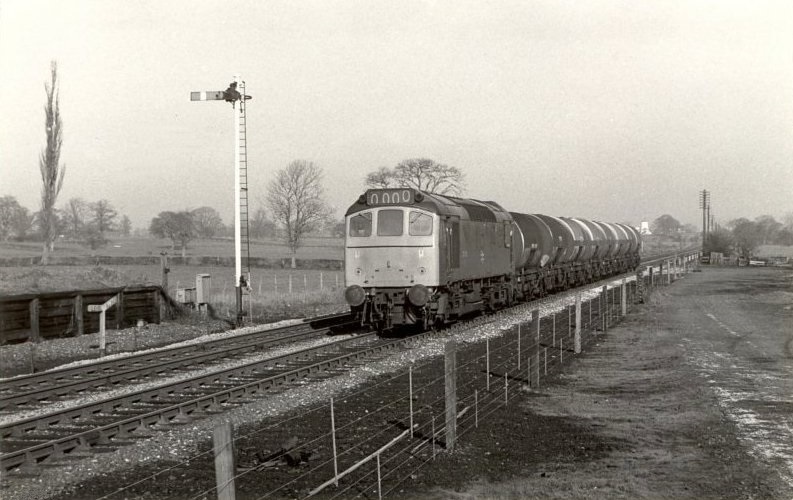 Its January 29th 1977 as 25108 passes Prees on the Shrewsbury - Whitchurch line. 25108 was noted on Ayr depot on March 13th. Photograph courtesy Mike Cooper Scottish memories from Ferryhill, this time with 25108 front & center, seen here during the summer of 1977. On June 20th 1977 a Fort William - Glasgow Queen Street service was worked by 25108. 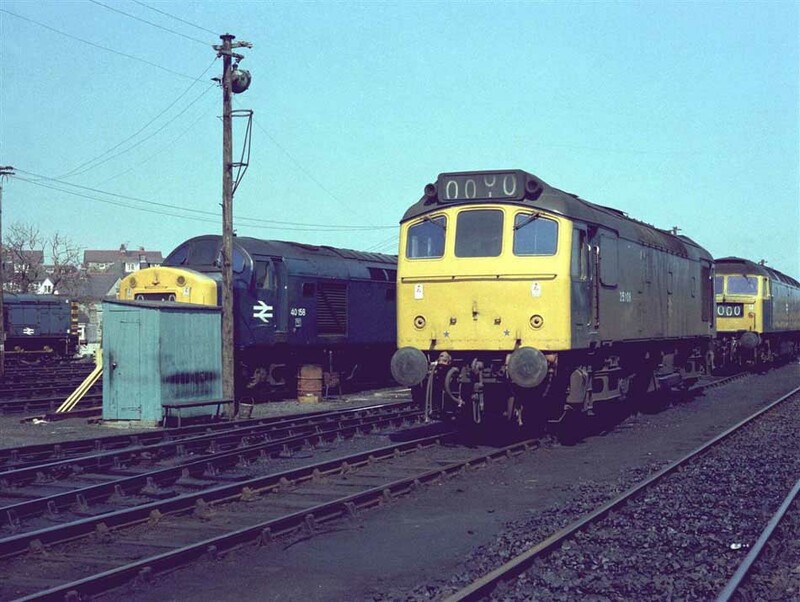 A month later on July 22nd 1977 the 22.00 Stranraer Harbour - Euston was worked to Carlisle Kingmoor by 25108 & 25158. On September 5th (?) 1977 the 23.45 Inverness - Glasgow Queen Street was worked forward from Perth by 25108. On July 31st 1978 the 12.50 Mallaig - Glasgow Queen Street was worked forward from Fort William by 25108. The next day (August 1st) 25108 was in charge of the 18.18 Glasgow Queen Street - Oban. The 13.20 Glasgow Queen Street - Oban on August 7th 1979 was worked by 25108. On August 17th 1979 a Perth - Edinburgh was worked by 25108. A short working for 25108 took place on September 21st 1979 with 25108 working the 04.20 Mossend Yard - Glasgow Queen Street forward from Cowlairs Junction, being the portion off 1S07 Euston - Inverness. The WCML near Abington was occupied by the engineers on February 3rd, with six Class 20s in use and one Class 25, 25108 working the wiring train. 25108 handled a couple of passenger workings shortly before its withdrawal. On May 31st 1980 25108 worked the 08.10 Glasgow Queen Street - Scarborough to Edinburgh. Its final recorded passenger working took place on June 5th 1980 with the 12.44 Glasgow Queen Street - Dundee. 25108 was noted at Glasgow Queen Street on May 28th. 25108 was noted at Motherwell on July 5th. 25108 was withdrawn July 14th 1980. Page added October 7th 2013.